Summary: Reese and David are not normal teens—not since they were adapted with alien DNA by the Imria, an extraterrestrial race that has been secretly visiting Earth for decades. Now everyone is trying to get to them: the government, the Imria, and a mysterious corporation that would do anything for the upper hand against the aliens. Review: I thought long and hard what to write for this review because there is so much to Malinda Lo’s awesome-sauce speculative fiction novel that I just don’t know where to begin, or to write without giving away spoilers. 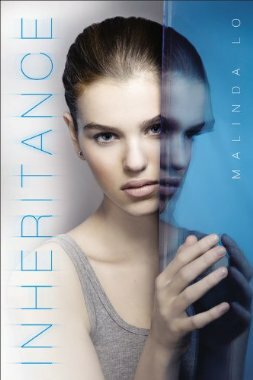 Inheritance is the sequel to Lo’s third novel, Adaptation, where high school students Reese Holloway and David Li undergo surgery where their bodies are transformed by the Imria. Adaptation is a fast paced novel that explores the changes Reese and David experience, as well as Reese coming to terms with her sexuality when she falls for a girl named Amber Gray. The novel ends right at an intense point, where I could imagine Lo fans screaming in frustration, desiring to know what happens next. Luckily for me, a mere days after I finished Adaptation, the opportunity to read the ARC of Inheritance was presented to me and I jumped at the chance. Fans of Adaptation will not be disappointed with the conclusion of Reese’s and Amber’s and David’s story. In fact, the tension in Inheritance becomes even more intense. The conspiracies spin out of control, the danger becomes real as both Reese and David experience violence from extremists on both sides who react exactly as imagined upon learning that beings from another world exist. And the love triangle between Reese, David and Amber is handled with such delicate care that the reader really can’t choose who to root for. Lo resolves the triangle in an unconventional way that will have fans either loving the resolution or hating it. I, in fact, loved it and thought it to be a brave choice by Lo. Inheritance begins where Adaptation left off and doesn’t slow down for a minute. While there is less physical action scenes, the novel explores the consequences of what would happen to our society if the notion of aliens visiting our planet turn out to be true. The novel also explores the idea of “fame” and the role the media plays into the daily lives of those who are thrust into the spotlight as Reese and David are. I find that these types of stories are more compelling than your regular action mystery/SciFi novel because it allows us, both the writer and the reader, to look at our society in a unique way and answer the question of “what if”. By playing with these “what if” scenarios through novels like Inheritance, we can be prepared for when the events actually occur. I greatly enjoyed Inheritance and while the ending is left on a positive note, and definitely completes the story, there is much more to explore in Reese’s world. I hope Malinda Lo has more planned for Reese, Amber and David, because I’d really like to spend more time with them. Recommendation: Get it now! Inheritance comes out on Sept. 24th. If you haven’t read Adaptation, buy it now and then pre-order Inheritance. I read Adaptation a few months ago and when I finished it was like AHHHH NO I NEED THE SEQUEL NOW. Can’t wait to get my hands Inheritance when it comes out.